Sumit Roy received the B. Tech. degree from the Indian Institute of Technology (Kanpur) in 1983, and the M. S. and Ph. D. degrees from the University of California (Santa Barbara), all in Electrical Engineering in 1985 and 1988 respectively, as well as an M. A. in Statistics and Applied Probability in 1988. His previous academic appointments were at the Moore School of Electrical Engineering, University of Pennsylvania, and at the University of Texas, San Antonio. He has been at UW since 1998, where he is presently Professor of Electrical Engineering. His research interests include analysis/design of wide range of next generation wireless communication systems/networks, inclusive of PAN/LAN/MAN, sensor, vehicular and RFID networks. 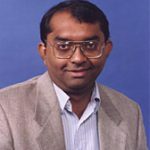 He has served as Associate Editor for IEEE Trans. Commn. and Wireless Communications, undertaken lead roles in conference organization (Vice TPC Chair for WCNC2005) and was selected Fellow, IEEE for his contributions to cross-layer design of wireless networks and emerging wireless standards.